While everyone else was out gathering free candy, and drinking pumpkin spice lattes and wearing comfy scarves, I stayed indoors and hid behind couches. BECAUSE I THOUGHT I WAS DEAD. I thought I was a ghost doomed to roam around public school hallways forever. My freshman year of high school, which was pre-doomsday, Fahrenheit 451 was required reading and was not yet considered non-fiction. Since I was also a lazy freshman I got most of my information for my English paper from Wikipedia and found out that my “memory” was actually a clip from the 1993 animated version of Ray Bradbury’s 1972 novel The Halloween Tree. If I had pearls you know I would’ve been clutching them. Who knew I was such a good detective. 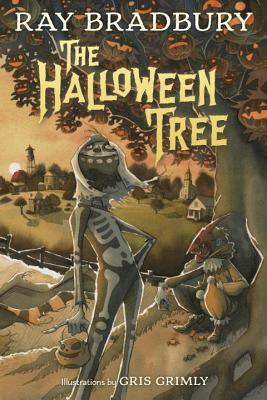 The Halloween Tree is a true fall special. It’s a story of Eight friends on Halloween night all dressed up and ready to go- a skeleton, a mummy, a witch and one super goth kid is Mr. Death- but they’re missing the group favorite, Pipkin. He looks unwell but has never missed a Halloween and tells them he will meet up with them as they go on. The group arrives at a mysterious gothic mansion (obvs) with a gigantic tree hung with jack- o-lanterns; they discover that the house is inhabited by an equally mysterious man named Moundshroud (obvs). Just then Pipkin appears, but is snatched away by unknown forces and dragged into the dark, unknown space. Mr. Moundshroud then invites the group on a strange journey across time and the world, to save their friend. And possibly the world, who knows. Bradbury writes in a simple, yet elegant language, and his words are filled with nostalgia for the earlier, simpler time of youth and childhood and the sense of mystery and adventure that comes from the shorter and colder days. So thankfully I am not a ghost but my memories are all fake so…there’s that.